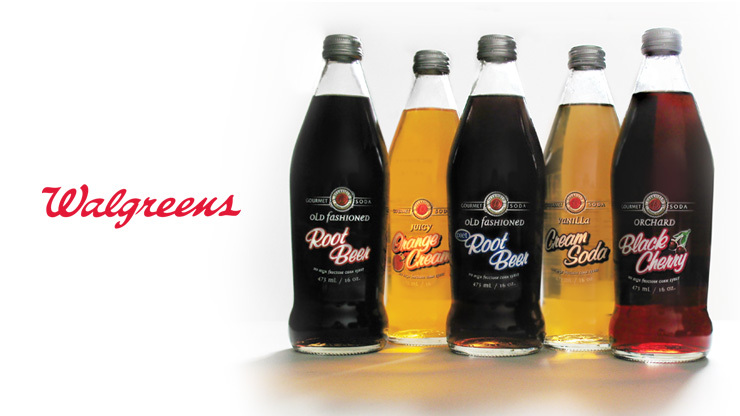 Worked with client to create packaging for a new Walgreens premium soda product to capitalize on the renewed interest in ‘old-fashioned’ naturally flavoured soda products sweetened with real sugar. Objective was to create a package that would communicate the various product attributes and communicate the premium positioning of the product. Worked with key client contacts to help identify other products and package executions in similar/other categories that were felt to be good examples of the ‘look and feel’ they desired. Based on final briefing and directional conversations, execute design of packaging for 5 SKU’s. Product launched in all 5,700 Walgreens stores nationally in early June of ’07 with national newspaper support of special launch promotional pricing and in-store display activity. Certain SKU’s continue to be sold in selected regions.